The lawsuit, which seeks a trial by jury and unspecified damages, was filed on behalf of six students and one parent who fell ill after eating at a Chipotle in Simi Valley. A class-action lawsuit filed in federal court Tuesday accuses Chipotle of trying to cover up a norovirus outbreak that sickened at least 234 people who ate at the Mexican fast food restaurant in Simi Valley, California. The lawsuit, which seeks a trial by jury and unspecified damages, was filed Tuesday on behalf of six Grace Bretheren School students and one parent who fell ill after eating at Chipotle's Simi Valley location in August. According to the lawsuit, a kitchen manager suffered gastorintestinal symptoms while at work Aug. 18 but allegedly continued handling and preparing food until he saw a doctor Aug. 20 and was diagnosed with norovirus. That day, Chipotle shuttered its Simi Valley restaurant and enacted its "Norwalk Protocol," a procedure initiated when at least two customers complain of foodborne illness symptoms. The restaurant's corporate office, however, did not immediately contact health officials or customers, the lawsuit alleges. "Chipotle chose instead to try and conceal all evidence of the outbreak by disposing of all food items, bleaching all cooking and food handling surfaces and replacing its sick employees with replacement employees from other restaurants before notifying county health officials of the outbreak," the suit claims. 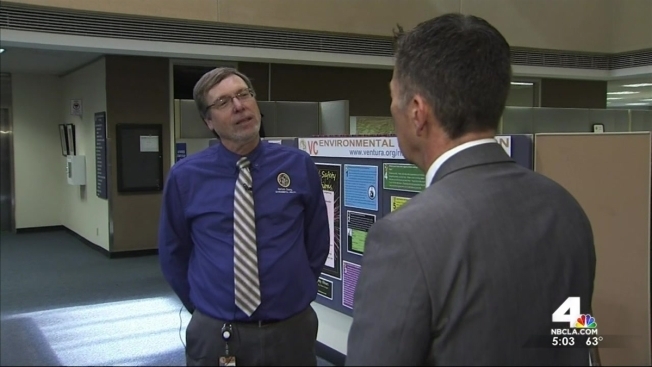 The manager of the Ventura County Environmental Health Division's food safety program is quoted as saying authorities "didn't have the opportunity to sample food or do some of the things we normally do to investigate a foodborne illness outbreak." The lawsuit alleges Chipotle tried to cover up the outbreak because it was also dealing with "another public relations disaster" linked to a foodborne illness outbreak in Minnesota and "wanted to protect its stock price from plummeting by putting corporate profits ahead of public health and safety." Chipotle spokesperson Chris Arnold declined to comment on the lawsuit Wednesday morning, saying in an email to NBC, "As a matter of policy, we do not discuss details surrounding pending legal actions." Arnold added, however, that Chipotle "took all appropriate actions when this incident began, including reporting it to health officials in Ventura County." The lawsuit claims Chipotle waited to report the outbreak. The chain's founder and CEO, Steve Ells, told the "Today" show last month he was "deeply sorry" for outbreaks of norovirus and E. coli that have plagued customers around the country over the past several months. He vowed to make Chipotle "the safest restaurant to eat at." Ells said in a statement Tuesday the chain has "been implementing an enhanced food safety plan that will establish Chipotle as an industry leader in food safety." He said much of the plan is already in place, adding that food suppliers are also subject to rigorous, "unprecedented" safety standards. Last year's norovirus in Simi Valley came on the heels of a salmonella outbreak linked to tomatoes in Minnesota. E. coli connected to Chipotle sickened dozens of people in nine states last November, and five more cases were reported in December. Also last month, 141 college students contracted norovirus at a Chipotle restaurant in Boston, prompting a Massachusetts woman to sue on behalf of her son, who fell ill.
Federal officials recently launched a criminal investigation into the restaurant chain and Chipotle was subpoenaed shortly after. The company has announced plans to launch a new marketing campaign in February and will close restaurants nationwide for three hours Feb. 8 to brief employees on food safety.